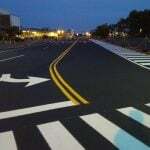 As we discussed in our previous two blogs, there are three essential structural elements of pavement that we will review in our Asphalt Pavement Guide series; subgrade preparation, pavement thickness, and drainage. 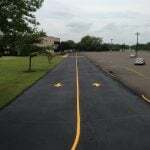 When discussing these three elements, we have continued to speak in terms of residential asphalt pavement vs. commercial asphalt pavement – in other words, your driveways vs. your parking lot. In this blog, we will focus on our final element, drainage (review our previous blogs in the series on subgrade preparation, and thickness). Although this is the last element we will be covering in this series, it is one of, if not the most important. Proper drainage is essential for any successful and quality paving job. 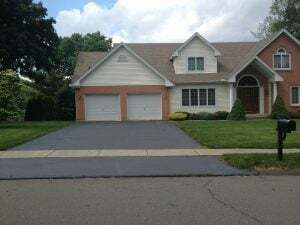 Without proper drainage, your pavement may deteriorate quickly and/or cause other issues like foundation water damage. Pooling water in central areas of your lot or driveway and/or running water down the center of your lot. If you are seeing rocks, sand, or dusty residue on your pavement, this could be a sign that your asphalt surface isn’t draining right, as this is likely a result of water breaking down asphalt and carrying debris from pavement with it. Water leakage or damage of exterior walls. The slope of your pavement should be designed to force water to run in a specific direction and/or to a specific area. Water should always run in a path that is moving away from exterior walls. Proper driveway drainage can likely be achieved by sloping the asphalt pavement one way or the other. For longer driveways, there should be a 2% (or more) slope to ensure proper drainage. Some drainage problems can stem from improper surface installation, and/or aggressive sprinkler usage. 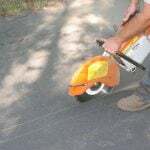 Making sure there is proper pavement slope is key, as well as adequate catch basins. When it comes to commercial parking lots, it is important to monitor sprinkler use and location. Excessive sprinkler usage that lands on the pavement could result in repeated saturation of the pavement, leading to structural damages over time. 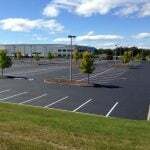 There is no feature more important than drainage for commercial parking lot projects. This will determine how your lot will withstand weather conditions and traffic. Once water penetrates a subgrade, it is very slow to evaporate and/or drain. In fact, the subgrade may remain damp or wet indefinitely, even in dry weather. Since subgrades have the presence of silt, clay, and soil, a wet subgrade becomes weak, as these materials lose strength when wet. 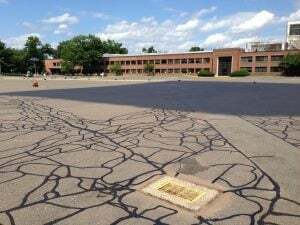 For more on the importance of parking lot drainage systems visit our blog; An Invisible But Vital Aspect Of Parking Lot Paving.